Ok, I haven't touched this blog in forever. I originally intended to post pre-established characters I've drawn on this blog. I haven't drawn any since Hellboy, and I'm so wrapped up in a new project right now that I don't know if I'll ever get to the next character on the slip of paper I picked out of the "character glass." So it's time to evolve the idea of this blog. I will now use this blog to post new stuff I'm working on. Snippets of projects and finished pieces will be posted for your delight and benefit. Things that tickle my fancy will also be posted and commented upon. It's a brand new, no-holds-barred ART BLAWG! So let's get down to brass tacks. 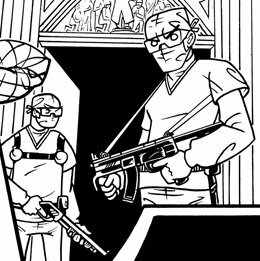 The two dudes in the image above are from the cover of the first issue of a currently untitled 5-issue limited series I am working on for a company I will not disclose right now. I won't be posting too much of this stuff before it actually sees print to keep the shroud of mystery intact. But I think I'll post little scraps and morsels here and there. And I will be posting more pre-established characters. I need to draw a lot. I need to be drawing right now. OH! And go buy the post-mortem Mitch Hedberg album, "Do You Believe In Gosh?" it's great and it came out yesterday. Great way to spend $10.